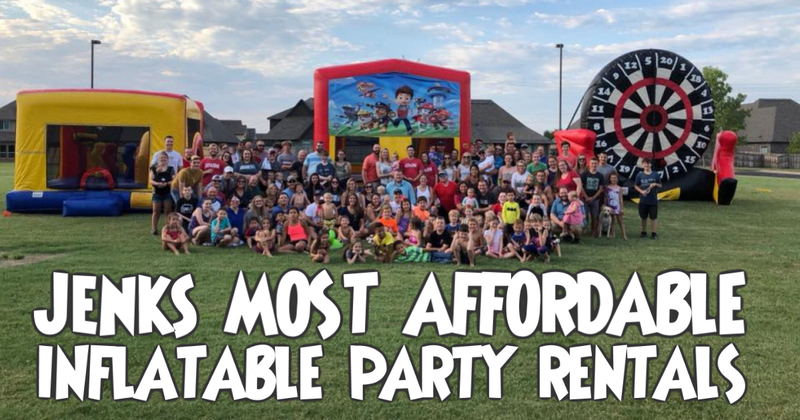 Bounce Pro Inflatables is proud to offer the best bounce house rentals, water slides, obstacle courses, tables, chairs and more that Jenks, Oklahoma has to offer. We are a full service event rental company and we can provide everything you need for your next party or event. Whether you are having a school field day, a birthday party, a church picnic or even a wedding, we have a great selection of items to make your event one of a kind. We have provided services to several schools, homes and businesses in the Jenks, Ok area including events for the Riverwalk, Turning Point Soccer, Titan Sports Complex, Jenks High School and many others. We really enjoy delivering the fun to fine folks of all the wonderful neighborhoods in the area including Aberdeen Falls and FlyingTee, just to name a few. We also proudly serve other areas in Northeastern, Oklahoma including but not limited to Bixby, Broken Arrow, Tulsa, Owasso, Sapulpa and all of the surrounding areas. Bounce Pro Inflatables is fully licensed and insured. Our staff will exceed all of your expectations and we guarantee that we will have your items delivered well before your guests arrive. So, what are you waiting for? Give Bounce Pro Inflatables a call today at (918) 299-2141 or email us at [email protected]. Also, we offer convenient, online, real time ordering. Simply add an item to your cart and follow the easy steps to reserve your next inflatable online 24/7. Thank you and we look forward to working with you.